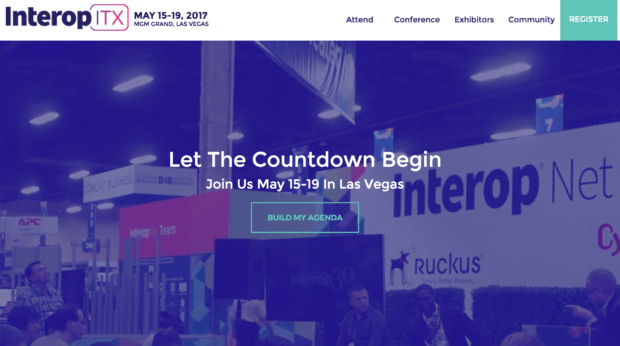 When the Interop ITX conference comes back to town May 15-19, things will be bigger and better and not just because this is Vegas, baby. Cloud computing use is growing exponentially as are all the problems with it. Several sessions provide crash courses in AWS best practices and managing containers over the course of the week. Other issues addressed will include security, big data management systems, and skilled labor shortages. A full agenda can be found HERE. Over 100 exhibitors will provide further information and networking opportunities. Expect all major players to be in Vegas for more than just good food and Cirque DU Soleil. That list is HERE. The highlights of Wednesday and Thursday are the keynotes in the MGM Grand Ballroom. That list of speakers is found HERE. No major information technology conference (or any other big event held in Vegas) would be complete without an awards ceremony which will start Thursday at 12:45 pm. Companion party and socializing to follow. Register for the event and find more information on the Interop ITX Conference website.